Photograph of a group of men sawing and removing blocks of ice from Mill Creek in Paxico, Kansas. 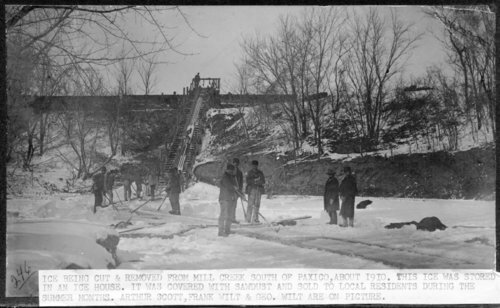 An attached caption reads, "Ice being cut and removed from Mill Creek south of Paxico, about 1910. This ice was stored in an ice house. It was covered with sawdust and sold to local residents during the summer months. Arthur Scott, Frank Wilt and George Wilt are on picture."